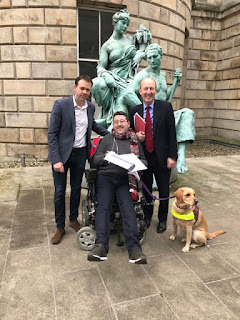 Sinn Fein TD for Wicklow/East Carlow John Brady has today held a productive meeting with the Minister for Transport Shane Ross along with local Disability activist Padraic Moran in Leinster House. “Earlier today, Padraic Moran and I held a positive meeting with Minister Shane Ross along with his Department officials and Senator John Dolan who also attended. “The purpose of the meeting was to afford Padraic the opportunity to clearly outline to the Minister, the many issues he faces as someone who relies on the DART to get to and from work on a daily basis. “While Padraic talked about his own experience as a regular commuter, the issues he raised are universal. They are the very issues that, in some cases prevent people with Disabilities from being able to access public transport and in essence, live their lives. “Minister Ross listened carefully to Padraic and took on board all of the issues that he raised. He confirmed that he would be in a position to make a significant announcement in relation to some of the issues raised at a Committee meeting next week. “The primary concern made clear to Minister Ross was the detrimental impact that the unmanning of DART and train stations will have on people with Disabilities. “Before the meeting concluded, Padraic and I presented the Minister with a petition opposing the unmanning of DART and train stations across the State which was signed by over 3,100 people.